Your gutters are an important part of your home – they not only carry water away from your roof, fascia, and siding, they also carry water away from your home’s foundation. So learning how to fix gutters is a good idea. If you have leaking or sagging gutters, your home won’t get the protection it needs. Our gutter repair experts can help you get your gutters back to doing their job right. If your gutters have leaks, they can be fixed with just a few materials. For small holes, all you’ll need is gutter sealant. Locate the hole in your gutter and wait until you have dry weather. Clean the area around the hole so that the sealant sticks properly. Apply a dollup of sealant to the area and let dry. This should seal your leak. For larger holes, get a gutter patch kit or a scrap piece of flashing. Cut the patch or the piece of flashing to fit over your hole. Then, glue the patch or flashing to the gutter using gutter sealant. If your gutters have sagged over time, they’re not doing their job correctly. Most of the time, this is because the hangers that attach the gutters to your fascia have deteriorated or have come loose. Luckily, sagging is an easy gutter repair. If you think you have a sagging gutter, prop your ladder against your roof and climb up. Look down the gutter line. If it’s straight, your gutters are fine. If they look to dip down, they’re probably sagging. Place a long 1×4 or 2×4 brace on the ground and use it to prop up the area of sagging gutter. Climb up your ladder and remove the two hangers nearest to the sag. 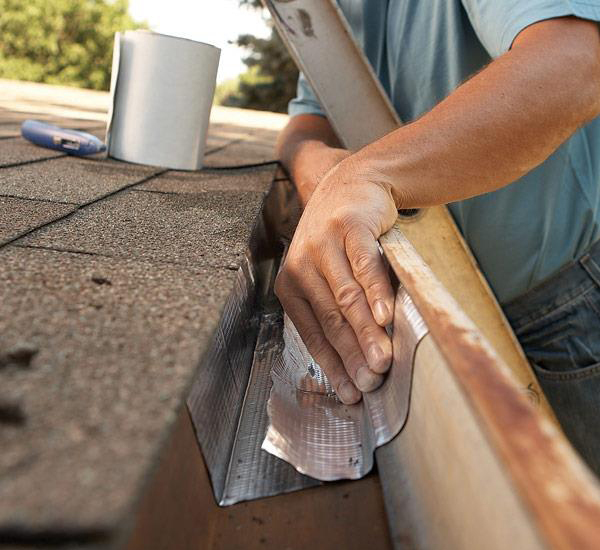 While looking down your gutter line, adjust the brace until the sag disappears.